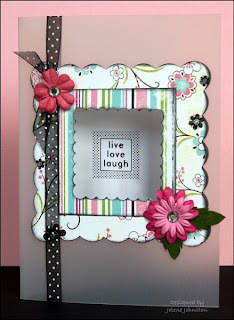 As a scrapbooker I rarely end up in layouts because I usually take most of the photos. 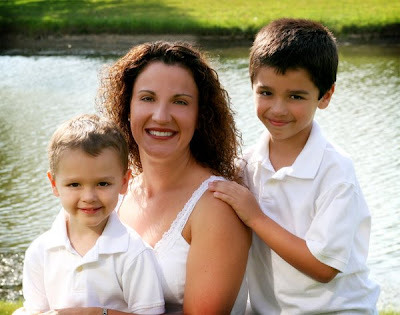 Thanks to a little photo shoot with my pal Celeste, I ended up with this awesome photo of me and the boys. Thanks so much, Celeste, for your time and talent!! It's challenge day at Caardvarks! Be sure to click here for all the challenge details. We're having a Baby/Bridal Shower in honor of all our DT baby mommas and to the one who is about to get hitched! Congratulations ladies! 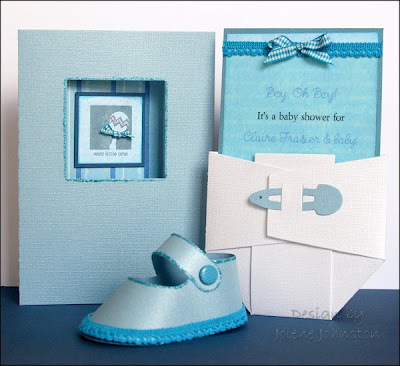 Create your *NEW* baby or bridal shower card and have it linked back to Mr. Linky at 'Varks by August 3rd at midnight PST. Our projects and the prize are sponsored by Creative Cuts & More. I had a BLAST making them! A Party of EPIC Size! 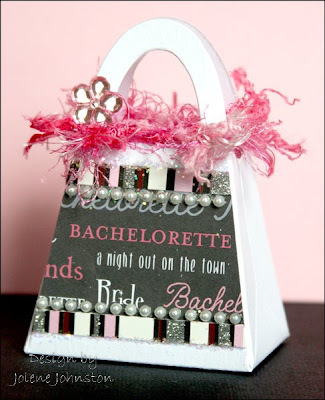 Don't miss the EPIC party at Scrapbook Express on Tuesday 7/14. Heather will be checking in with the forum and gallery and have random prizes to give away. They are having a contest where the Grand Prize is an Epic Machine!!! Pull out all of your QuicKutz and get ready to create! 5. If you put a picture of you scrapping for the contest in the forum or on a project you will get 5 additional entries!! 6. You are responsible to put your projects into the gallery and keep count on the forum. Only projects entered on 7/14 are eligible. It's a total blog blast - you'll be hoppin' for 3 days for a chance to win huge prize packages of Core'dinations cardstock, including their newest release "Whitewash". 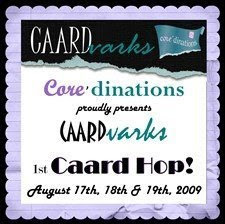 Brace yourselves for inspiration overload on August 17, 18, & 19th when we showcase *new* cards & projects using Core'dinations nearly hourly, and send you hopping! You'll enjoy designs by the 'Varks Crew as well as The Core'dinations very own Design Team. See you then! Bonus post today! 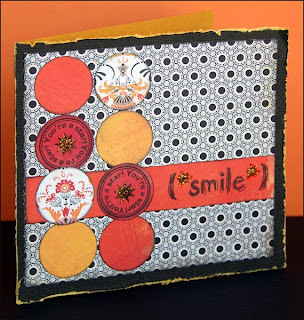 The myStampBOX designers are sharing some cards they made using sketches by DT member Allison Cope. Here's my card using Basic Grey Ambrosia papers, Core'dinations cardstock, Stickles and two mSB stamp sets: Seal It! and Sigh, Gush, Gasp. Check out the myStampBOX blog for all the sketch card inspiration! It's challenge day at Caardvarks! This challenge is sponsored by ShortCuts. 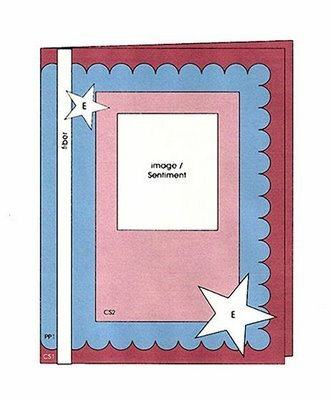 Launched in June of 2008, the sister site to SheetLoad of Cards, is dedicated making your papercrafting quicker and easier. Everybody likes a short cut every now and then! THE CHALLENGE: Create a card based upon this sketch, by ShortCuts. Entries must be linked to us via Mr. Linky at the bottom of this post by July 17th at Midnight PST. Please link us **directly** to your blog post, not your blog address. THE PRIZE: Two (2) lucky winners this week will each receive a $15 ShortCuts Gift Certificate!! SHOPPING DISCOUNT: Want to try ShortCuts for yourself, while saving money at the same time? Just visit their Online Store and enter the discount code “Caard15” during checkout and receive 15% off your order! *15% will be taken off package price(s) only, not S/H charges. Orders must contain at least $5.00 in product, and be placed before July 31, 2009. Here's the card I made using the Shortcuts sketch. It uses a frosted card blank as a base. I cut a window in the front panel of the cart and used a piece of clear acetate to fill it in. The rest is lovely Bo Bunny papers, Prima flowers, a 7 Gypsies rub on and some help from my Cricut. You can check out my other Crew cards in the 'Varks gallery. Be sure to check out the full gallery of Shortcuts/Sheetloads projects made by the Caardvarks Crew. For our Caards & More projects this time around you are being treated to a travel game board by Carrie, a feminine gift bag by Pam and a dry erase calendar board by Mel. So clearly, this challenge is worth trying. *wink wink* GOOD LUCK! myStampBOX is celebrating Canada Day with a new release stamp set called Lots of Dots Sentiments. This set coordinates perfectly with Lots of Numbers and the Lots of Dots (alphabet) sets. 1. Leave a comment here. Please include your first name and last initial, plus your city/country. 2. On a second comment (same place) post a link to the place where you have posted about the myStampBOX blog (on your own blog or in a forum). Again, please include your name and last initial, plus your city/country. This contest is open until July 13. The winner will be announced at mSB on July 14.